Aida-America Corp., Dayton, OH: 937/237-2382, www.aida-global.com. A servo drive provides the ability to control press slide velocity at any point in the stroke, allowing a stamper to increase the stroke rate while working the material at a slower velocity than with a standard eccentric crank motion (Fig. 1). A servo press also can operate with a pendulum crank motion (Fig. 2), using only a portion of the bottom of the press stroke and swinging the crankshaft or eccentric gears back and forth. Okay, here’s the issue faced by our hypothetical stamping-plant manager. Business levels are pretty good and we’ve run out of press capacity. Management is on board with the idea of purchasing an additional press or presses to meet production requirements. When developing a budget to justify the investment, we reach a crossroads. 1) Increased parts per minute (PPM —more PPM equals less cost per part). 2) Improvement in part quality (less rejects equals more profit) and reduction in tooling cost. 3) Reduction of raw-material cost. 4) Reduced costs for press and tooling maintenance. 5) A reduction (or elimination) of secondary operations. 7) Shifting of the “tough-to-make” parts to the servo press. 8) Increased flexibility, which opens the potential for acquiring new customers and entering new markets. Because the servo drive provides the ability to control press slide velocity at any point in the stroke, we can significantly increase cycle rate while slowing slide velocity only during the working part of the stroke. This allows us to increase the stroke rate while working the material at a slower velocity than we would experience with a standard eccentric crank motion (Fig. 1). An automotive contract stamper moved this difficult part from a 1200-ton mechanical press to an 800-ton servo press. It programmed the press slide motion to hit the part three times in rapid succession at the bottom of the press stroke, much more effective than hitting the part with more tonnage or adding restrike stations to the die. We also can operate the servo press with a pendulum crank motion (Fig. 2), setting the program to use only a portion of the bottom of the press stroke and to swing the crankshaft or eccentric gears back and forth. 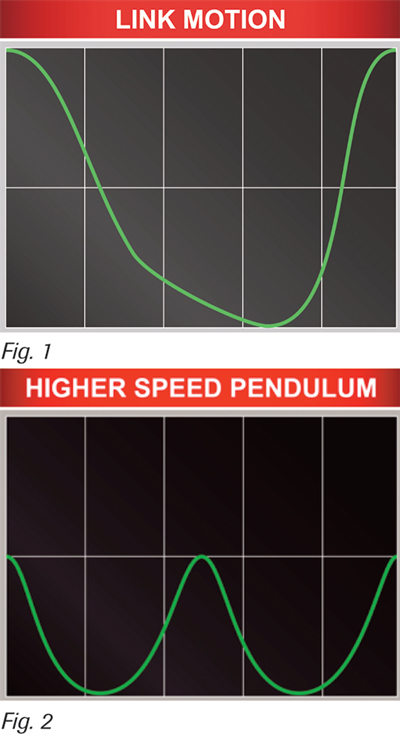 Pendulum motion provides the ability to switch from long-stroke heavy-forming operation to short-stroke light forming in the same press, while ensuring optimal forming speed for any stamping operation. The transition to difficult-to-form higher-strength steels and exotic materials in the automotive and other industries has forced the metalforming industry—including press makers—to evolve. These materials are harder and stronger than the mild steels they are replacing, requiring manufacturers to increase press tonnage and bed sizes to accommodate the more complex tooling needed to produce satisfactory parts. Even with these press advances, often it remains difficult—if not impossible—to produce parts that meet the shape and tolerance requirements dictated by customers. Fig. 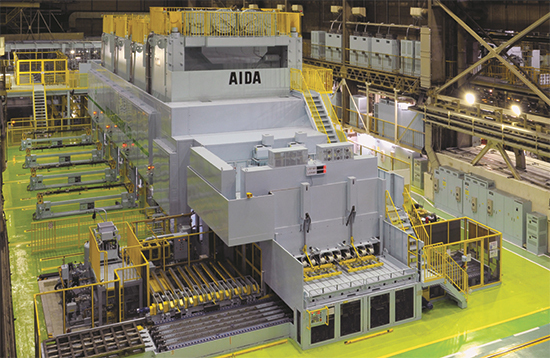 5—A North American automotive OEM that installed this four-servo-press line was able to expand the specification range of its raw material, and enjoyed a drop in material prices as a result. As press tonnage and bed size increases, so does the purchase price. In one instance, an automotive contract stamper overcame this problem by moving a difficult part with significant quality issues from a 1200-ton mechanical press to an 800-ton servo press. It programmed the press slide motion to hit the part three times in rapid succession at the bottom of the press stroke. This procedure proved much more effective in achieving close part tolerances than hitting the part with more tonnage or adding restrike stations to the die (Figs. 3-4). Eliminating restrike stations in the die reduced the overall tonnage required and allowed use of a shorter press bed, minimizing the cost of the press and the dies. Formability issues often dictate that the raw-material’s specification range becomes more limited and, as a result, the material price rises. The programmable slide of a servo press often allows metalformers to expand the specification range of their raw material, achieving significant cost savings. In one case, a North American automotive OEM installed a four-servo-press line to produce auto-body and outer-skin components and enjoyed a drop in raw-material prices as a result (Fig. 5). The ability to control slide velocity during the working portion of the press stroke enables stampers to reduce the shock and vibration associated with metalforming operations. Lowering punch velocity during forming also significantly reduces heat generation, with a corresponding improvement in die life. Fig. 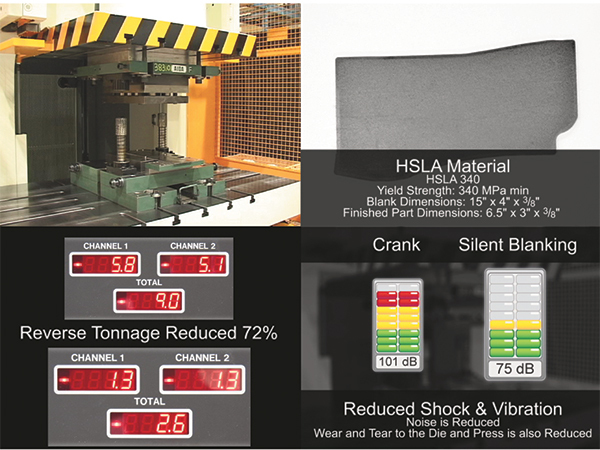 6—Moving this blanking die to a servo-driven press allowed the use of a silent blanking-motion profile that reduced forward tonnage by eight percent, reverse load by 72 percent and noise level from more than 100 dB to just 75 dB. As a result, die life more than doubled and negative effects of reverse tonnage were nearly eliminated. Consider the blanking die shown in Fig. 6. When run on a conventional mechanical press, the die requires 114 tons in the forward direction and results in nearly 14 tons of reverse loading; noise level exceeded 101 dB. Moving this die to a servo-driven press allowed the use of a silent blanking-motion profile that reduced forward tonnage by eight percent, reverse load by 72 percent and noise level to 75 dB. As a result, die life more than doubled and negative effects of reverse tonnage were nearly eliminated. In addition, taking a the flywheel and main motor drive as well as the clutch and brake mechanism reduces the cost of press maintenance, since we’re eliminating wear components such as O-rings, seals, discs and linings. The ability to program slide motion and incorporate secondary operations into the initial press operation has provided many servo-press users with significant savings. In-die assembly, tapping and welding become much more practical in a servo-driven press because the time required for these operations can be programmed into every press cycle. Stampers also can eliminate in-process annealing operations with a servo press, due to the precise velocity programs used to form high-strength steels or exotic materials such as magnesium and titanium alloys, Inconel alloys and even some grades of high-strength aluminum. Often, reducing the forming velocity reduces the heating of the material being worked, which limits work hardening and improves formability. However, in other cases the addition of heating elements in the die and a programmed dwell in the press cycle enables the warming of the material being formed, which can significantly improve formability. Fig. 7—By applying large capacitance to a servo-press control system, stampers can significantly reduce power consumption —by as much as 10 to 50 percent, or more. In this example, peak load on the factory main line is reduced by 67 percent. By applying large capacitance to a servo-press control system, stampers can significantly reduce power consumption—by as much as 10 to 50 percent, or more. In the accompanying servo-press load-distribution graph (Fig. 7), the heavy blue line represents press slide position and the thin blue line represents the energy required to form the part. 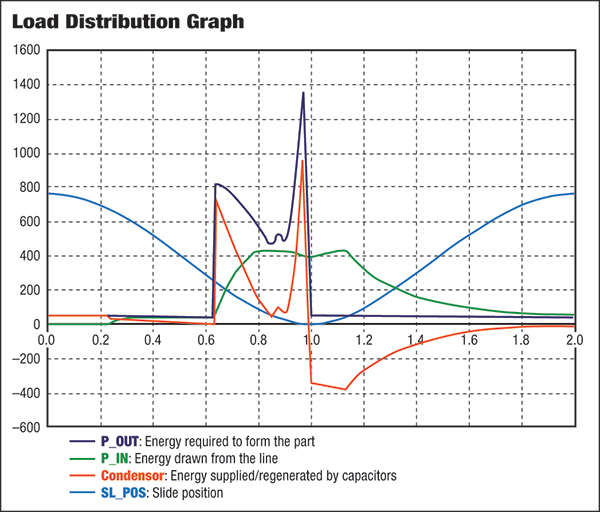 The green line shows the energy drawn from the factory’s main power line; the remaining energy consumed comes from capacitors recharged during the nonworking portion of the press cycle. In this example, peak load on the factory main line is reduced by 67 percent. This compared to a standard mechanical press which continues to draw a large amount of power during the nonworking portion of the cycle, since the main motor works hard to bring the flywheel back up to speed between hits. Many servo-press users shift production of all of their most difficult jobs to their servo press. As a result, they often turn “losers” into “winners,” enjoying a reduced reject rate and increased PPM. A side benefit: Production time becomes available on conventional presses used for easier work. One servo-press owner recently noted that it’s now soliciting jobs for its servo press that other stampers find too difficult or costly to quote. The proliferation of high-strength steels and aluminum grades and increased use of exotic materials bodes well for stampers investing in servo presses. Stampers traditionally focused on the automotive industry can leverage the capabilities of a servo press to look at other markets. Likewise, those concentrated in the appliance market may be able to stick a toe in the automotive market, due to the flexibility of a servo press. We’ve taken our time and completed our investigation of servo-driven press technology, and have reached a conclusion. Every stamping operation is different and not every metalforming job will run better in a servo press. But, the vast majority will. The servo press has the flexibility to address nearly all problem areas found during metalforming. A testimony to this is the number of servo-press users that buy a second or third press, after gaining experience with their first machine. I have heard that using servos is really helpful in production. It sounds like these presses are really great for increasing efficiency. This might be interesting to look into more, because right now my friend is working to make various products. I think that if she were to suggest that they get servos to help move everything along that their production would go much quicker!